Thanks to those that came to the beach clean. We managed to collect 13 bags of rubbish, which we left on the Borth & Ynyslas Golf Course. The Golf Course kindly remove the bags for us. I haven't been able to speak to Gareth yet about using the quad bike as he has been away. I hope to speak to him at the weekend. We can't do this week as we have an open day at the RNLI station in Borth on Sunday and I think we may be quite busy with that! Sunday June 2nd at 10am meeting at the Ynyslas turn car park. Thanks to those of you who came along to the clean on Thursday. In the morning the group worked by the RNLI station but after lunch we moved down to Ynyslas as there was deemed to be more rubbish there. Lots of people turned up - (I didn't count them as it wasn't my clean) - and lots of rubbish was removed from both areas. Beach clean at Borth beach on Thursday 16th May meeting at 10am at the car park adjacent to the RNLI, or just turn up any time between 10am and 3pm. Litter picking kit will be provided so just bring yourselves along. 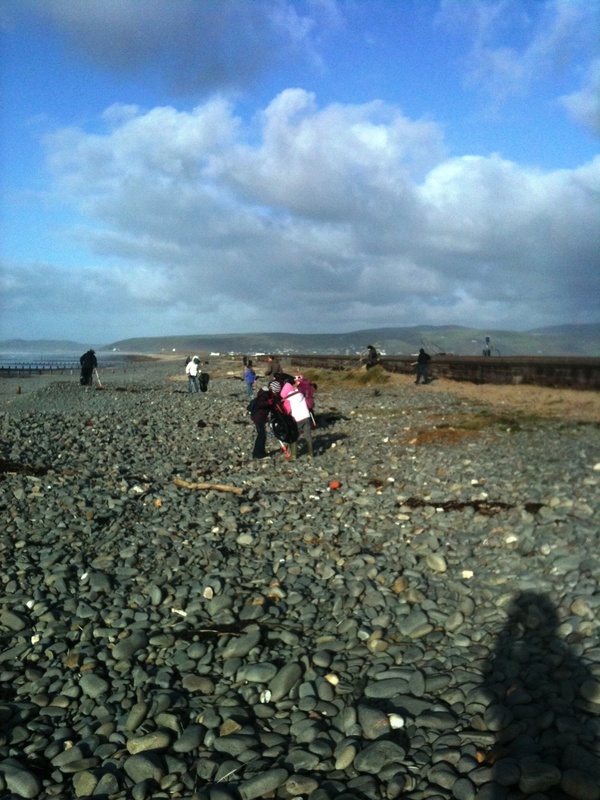 The last beach clean of 2011 was on Sunday 11 December. The rain had passed and the day was quite warm. Six of us turned up to clean the beach and we were going along fine. The rain came, a persistent drizzle, which made things more difficult, but not too bad. Next Beach Clean Sunday 11th December at 1pm meeting at the Ynyslas Turn car park. The last clean we did was very well attended. 19 people picked up 21 bags of rubbish from the beach opposite the Youth Hostel. Thanks to everyone who came. Sunday 11th December at 1pm meeting at the Ynyslas Turn car park. I know it is short notice (as it often is) but if you can make it that would be great. We normally spend about an hour and a half cleaning. We had a good beach clean. The weather was sunny and dry, although it was very windy. Nineteen people, and a couple of dogs, turned up to help and we worked both directions from the youth hostel. Everyone put in about one and a half hours and we managed to remove 21 bags full of rubbish from the beach. Well done everyone. Thanks to everyone who came to the last beach clean. There were 14 people and we managed to collect 15 bags and assorted bits of plastic. For our next effort can we meet at the Youth Hostel on Sunday 27th November at 1pm. We'll try to get a look at the beach before then to decide where to concentrate our efforts. We will spend about an hour and a half cleaning. On Sunday October 2nd at 2pm we met at the Ynyslas Turn car park. There was plenty of rubbish there needing to be picked up so we went over the wall and worked North and South. The weather was glorious and the 14 people that turned up to help had a fine day to enjoy. We left 15 bags at the entrance to the car park, from where the council picked them up. 12 people turned up to clean the beach alongside the golf course. Together we removed 24 bags full of rubbish. The following links to a trail showing where we cleaned.